I recently had to have my hot water heater replaced, and of course that meant that a county inspector had to come and sign off on the permit. While he was doing that, he asked me if our house had a carbon monoxide (CO) detector. "Sure," I replied, "It's in the basement near the furnace and hot water heater." Well, it turns out that changes in the building code have made it so at least one CO detector needs to be 15 feet away from each bedroom. This ended up being the perfect opportunity for me to try the 2nd-generation Nest Protect Carbon Monoxide and Smoke Detector ($99). I stayed away from the first-generation model, as it had a reputation for being quirky and annoying. For example, you were supposed to be able to shut off a false alarm by waving your arms at it - that apparently didn't work that often. The design of the previous model captured dust, which often caused false positives. Those issues have been been resolved with the new model. You can shut off an alarm either by pushing the central button of the unit or -- much easier -- pulling up the Nest app and just silencing the alarm. A new smoke chamber screen keeps dust and other foreign particles out, and the Nest Protect now has a split-spectrum sensor that can sense smoke from both smoldering fires and fast-burning fires. Something like a CO/smoke detector needs to look good, as it's going to be on your wall every day. The Nest Protect design is quite attractive, and the device can be mounted on a wall or ceiling as long as certain rules are followed. The mount has four drywall screws and it's very easy to install; once you have tested and set up the alarm, mounting it on the wall mount is just a matter of lining up three small arms and then rotating the alarm clockwise. That should make it easier to remove the Nest Protect for cleaning or changing the batteries. The unit runs on six AA batteries, and there's also a model that can be wired in. On the front of the unit is a single large circular button that has a ring of glowing LEDs beneath it. The LEDs are blue during setup, green when a test has been successfully completed, yellow during warnings or when maintenance is due, and red when carbon monoxide or smoke is detected. I'm relatively clumsy when it comes to installing things, and I found the Nest Protect to be a cinch to set up and install. All it took was a single Phillips-head screwdriver and a stepladder, and I was in business. The setup process took very little time. I simply powered up the app, added a new device, pulled a tab that exposes the batteries and powers the unit up, pointed the iPhone at the back of the unit so it could read a QR code, entered some information about the type of room (i.e., "master bedroom"), and then listened to verbal commands that told me what to do or what was about to happen. The alarms are LOUD. Fortunately, in many situations you'll get a verbal warning ahead of time from a very "Siri-like" voice. For example, if something's burning in the kitchen and it detects a small amount of smoke, you may get a verbal warning message that "There's smoke detected in the master bedroom". At that point, you can choose to either find the source of the smoke or -- if you know that you burned a pork chop -- silence the alarm from the app. This shows both Nest devices I own, the Nest Cam and a Protect. The second-generation Nest Protect also does something rather nice each evening when the lights are turned out -- it glows green to let you know that everything is OK with the unit. If you get up in the middle of the night to check on a fussy child or go to the bathroom, it senses motion and turns on a dim white nightlight. The device allegedly does a self-check of its sensors and circuitry 400 times each day -- that's every 3 minutes and 36 seconds! In addition, once a month it will do a test of the verbal and siren alarms so you know everything's working. The time when that's set to go off can be set in the morning, mid day, or evening. Of course, since this is an Internet-connected device, you will receive warnings of CO or smoke alarms regardless of where you are. 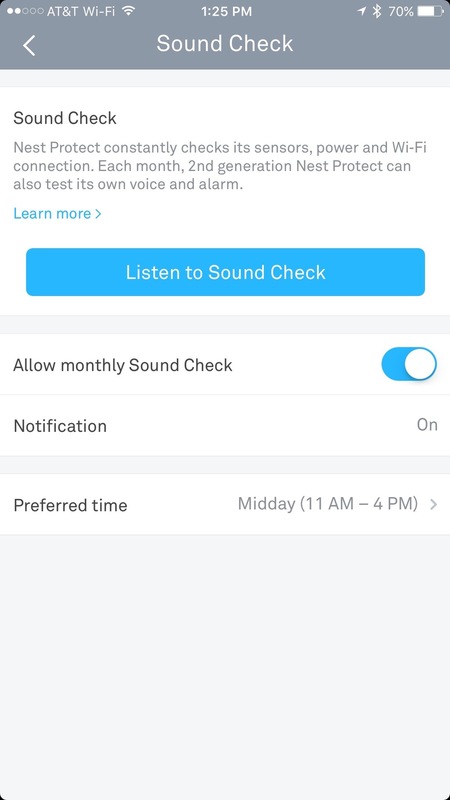 As I jokingly mentioned to my wife, "that would have done us a lot of good when we were cruising off of Antartica two years ago..."
Nest Protect doesn't support HomeKit, so there's no way to tell Siri to "shut the damned alarm off", nor can you ask if everything is OK at home and get a response that there are no current alarms. Nest, of course, is owned by Google and was started by ex-Apple executive Tony Fadell, who was well known for being the "father of the iPod". Well, Google really has no interest in creating HomeKit compatibility for its Nest products. They all -- Nest Thermostat, Nest Protect and Nest Cam -- work well with the iPhone through the Nest app, and they're all able to be set up with the Nest app. Sure, it would be nice to have the ability to have Siri control these devices through HomeKit, but I don't think it will happen. Of course, Tony Fadell has recently left Nest, so perhaps things will become more Apple-friendly at the company. One very nice thing is that Nest products do have slick integration with IFTTT. It's possible to do things like have lights automatically turn on if smoke is sensed, and actually very simple to set up an IFTTT recipe for that (see image below). What's your option if you want a HomeKit-compatible CO/Smoke detector? At this time there's only one that I know of -- the $109.99 First Alert Wi-Fi Smoke + Carbon Monoxide Detector. There were two reasons I didn't buy it instead: I didn't know about it when I went to make my purchase, and it gets lousy reviews (2.5 stars on Amazon compared to 4.5 for the 2nd-generation Nest Protect). Sure, you'll need a different app in order to set up and query your smoke and CO detector, but who really needs to talk to Siri about a smoke alarm anyway? The 2nd-generation Nest Protect is leaps and bounds better than the buggy first version, has a good reputation, and even has features that can assure you that it's actually working. It looks good, and the setup is one of the easiest home automation processes I've ever gone through. My advice? Don't worry about it not being HomeKit-compatible.